Of late, videos of drunk police officers in uniforms have gone viral on social media, with many observers worrying about the levels of indiscipline in the Zambia Police Service. Last year, an armed Police officers who was captured on video, seemingly drunk, coaked his AK 47 rifle while having an argument with Mazabuka Central Member of Parliament Garry Nkombo at a filling station in Lusaka. "Nikulasa, ndiwe ndani (I will shoot you, who are you?" said the officer as he moved around the filling station while holding his Russian made rifle in a ready-to-fire position. The video went viral and that was not the last one. Several others showing Police officers drunk, lying on the grown or walking unsteadily have become common. Similarly, pictures of female Police officers in tight skirts or trousers while on duty have also become common especially on Facebook. Officers innocently share these photos on Facebook and Instagram but cyber bullies and some blogs re-post them to make funny of the men and women in uniform. This has on several occasions left the Police Public Relations Office to issue statements to either protect the officers or guide on the approved dress code. But no senior Police officer has ever condemned this behavior in public. Until now, the public has been left to wonder whether the officers are rebuked silently or are left to enjoy their freedoms. But yesterday, the silence was broken by Malcom Mulenga, Zambia's second highest Police officer. 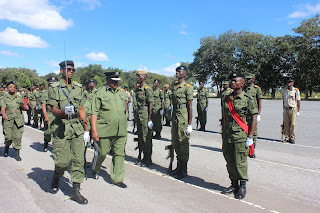 Mr Mulenga, who boldly took on officers to the shock of many high ranking Police officers, disclosed that discipline is going down among the law enforcers and there is urgent need to ensure that officers start working according to their code of standards. Speaking when he officiated at the pass out of 99 Police officers at the School of Public Order Maintenance in the mining town of Kitwe yesterday, Mr Mulenga said the indiscipline levels have reached a point where members of the public are now filming drunk Police officers. "These days, we see pictures of drunk Police officers being shared on social media. They even say bwana amwa (the officer is drunk). You are even smiling. That is bad, we need to protect the Police Service and we can only do so if we maintain total discipline," said Mr Mulenga. The Deputy Inspector General of Police also showed his displeasure among the graduating Police officers who were wearing old, torn and faded colours of uniforms during the pass out parade. He said he was disappointed that officers who were graduating were wrongly dressed and warned that if this repeats itself next year, he will postpone graduations until officers look smart and well dressed. "Some of you are wearing uniforms which are old, like they were bought in 1964. Am disappointed, you look dirty. You look like you have just come from the jungle and were told to come and form up on this parade," said the visibly annoyed Police chief. Due to some unprofessional conduct of its officers over the years, the Zambia Police Service has started retraining its serving officers. Last year, a total of 1,700 officers were retrained following the Police High Command's decision to conduct refresher courses for all officers every after five years. And this year, 3,000 officers from the rank of Constable to Chief Inspector are earmarked for refresher courses. "Of the 99 grandaunts we have today on this parade, 84 were males while 15 were female. These officers come from all the 10 provinces of Zambia," said Patrick Bili, the Divisional Commander at the School of Public Order Maintenance in Kitwe which is popularly known as Kamfinsa. Among the many topics the officers learnt were crowd control, gender based violence, criminal law, counter terrorism and child protection. These refresher courses, which are being held at Sondela in Kafue, Lilayi in Lusaka and Kamfinsa in Kitwe, take one month and are aimed at helping the officers to improve their professionalism. This is hoped to help reduce the sharing of pictures and videos of Police officers who find themselves in awkward situations. The Press Association of Zambia (PAZA) has commended PAMOS Media Consultancy for training journalists in budget tracking and investigative journalism as a way of promoting transparency and accountability in the utilisation of public funds. Speaking yesterday when he addressed journalists from across the Copperbelt during a two day workshop organised by PAMOS Media Consultancy in Kitwe, Mr Sakala said the workshop has come at a time when Zambians expect more from the media. “I wish to commend PAMOS and its funders the American government for organising this workshop. This training comes at a time when the public wants to know how its money is being spent. Is the money being spent wisely? These are the questions the public is asking” asked Mr Sakala. The veteran journalist urged journalists to do their watchdog role by following up all money which is channeled towards development. Mr Sakala said the fourth estate’s role of being the watchdog for the society will ensure that they also scrutinise the procurement process and expose any weaknesses or corrupt activities. He also challenged journalists to not only follow up on the national budget but also for the budget for local authority. “Do we know the budget for the Kitwe City Council? We need to spread our coverage to the local authority too. We need to know what is being spent on the roads, the parks and garbage collection,” he said. Mr Sakala is a veteran media trainer and journalist whose last editorial position was News Editor at the Times of Zambia. On Monday, Democratic Governance and Human Rights Advocates (DEGHA) President Gerald Mutelo was the facilitator during the first day of the training. Mr Mutelo trained the journalists in the budget cycle and made them do practical exercises in budget tracking. 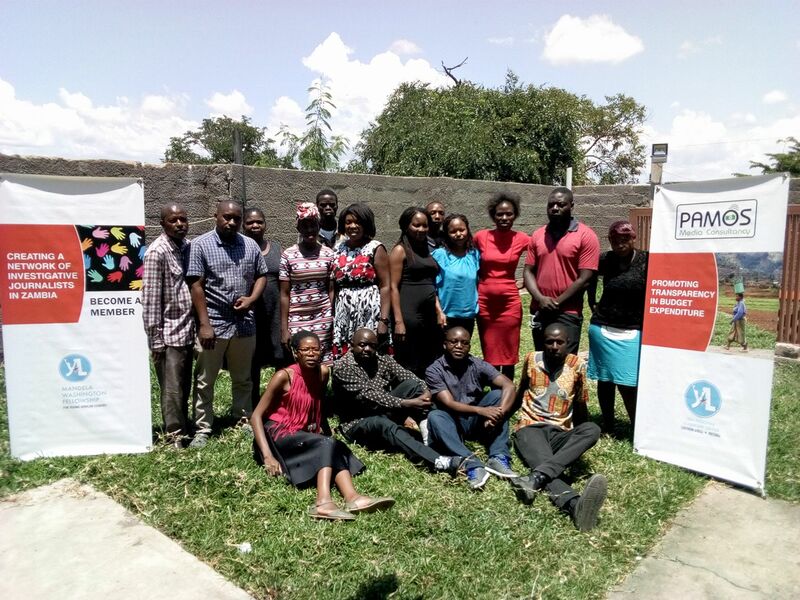 Nine journalists from across the Copperbelt attended the training. American Corner Coordinator Pamela Mutale officially opened the training on Monday. Ms Mutale urged the journalists to familiarise themselves with the American Corner which has alot of resource books for journalists who need research on various issues. The American Corner is located at the Copperbelt University's Institute for Peace and Conflict Studies. "I encourage you to be visiting us from time to time. We do publicise fellowships and grants which can be of interest to you. These are opportunities which can change your career path and benefit you," she said. The Copperbelt becomes the sixth province to host the United States-funded trainings since the project started in November 2017. Journalists in Lusaka, Southern, Eastern, Western and Central Provinces have already been trained. 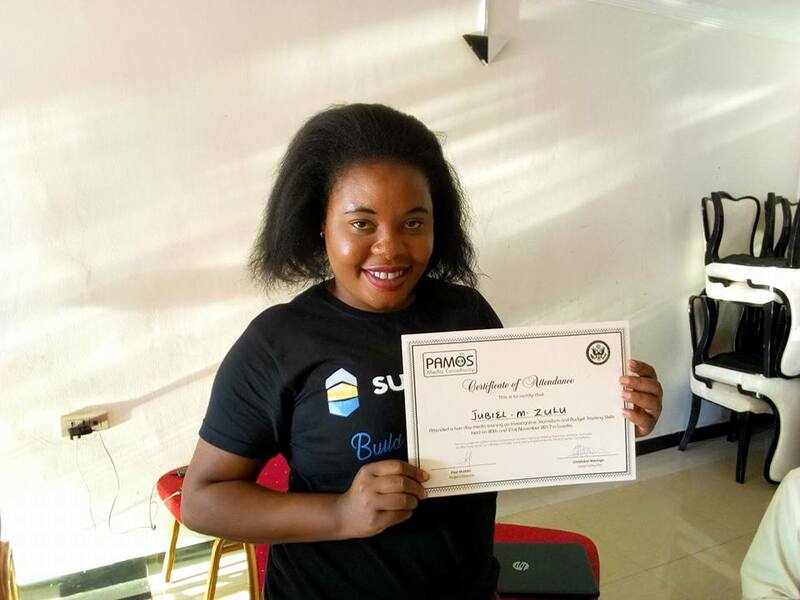 Next month, PAMOS Media Consultancy will be in the North Western Province to conduct a similar training before heading north to Luapula, Northern and Muchinga Provinces in the coming months. The trainings will conclude in September this year. 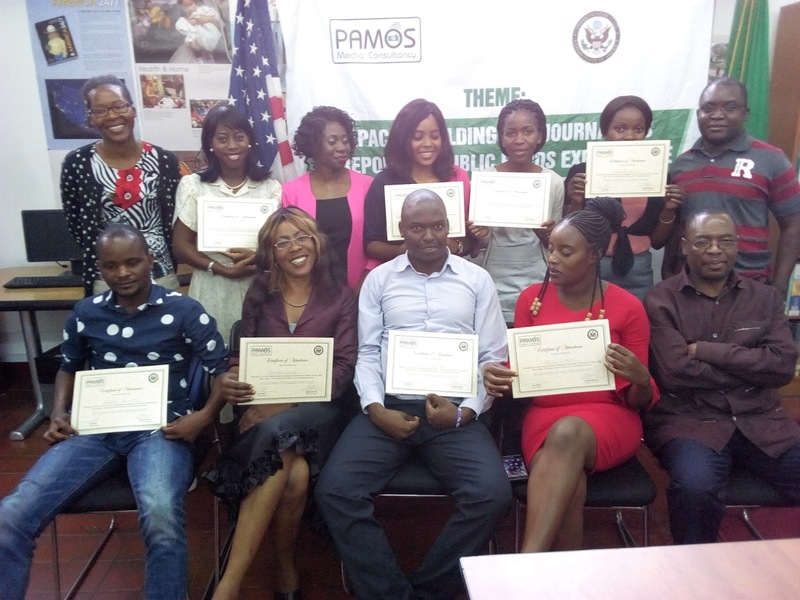 United States exchange alumni Paul Shalala and Christabel Mwango have been funded by the US government through PAMOS Media Consultancy to train at least 100 journalists in budget tracking and investigative journalism in all the 10 provinces of Zambia. From the six provinces covered so far, 91 journalists have been trained.